For one week, we traveled in our tribe of six. Reconnecting with parts of ourselves we had discovered out in the woods and within our hearts. Below are a few words from each participant about their experience. as the swells stretch for shore. where the peaks silently soar. I'll let my Hunger Roar. see the holes it bore? who, once rich, are now poor. it's searching for a door. we'll let our Hunger Roar. "The Journey is a Privilege, especially alone & together." 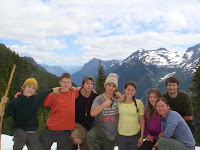 "We were hiking up to Desolation Lookout, trudging up the 4.25 miles of steep switchbacks. The sun right above our heads, we kept cool in the shadows of the trees. Our eyes were focused on the rocky path beneath our feet, one foot in front of the other. We were hiking for quite some time when Micah, our leader for the day, said "Stop! Deer!" Right in front of him, so close he could reach out and touch her, was a doe. She just stood there for a few moments on the trail looking directly at us as if she were surprised to see us there. Then, slowly, she walked into the trees. It was an amazing experience to be so close to something so rooted in nature. It made my day." As this week-long Journey begins to end, and I sit in the car on the long drive back to Songaia, my mind and heart are stretching as they try to hold onto all that has happened, while becoming excited for the future, and most importantly, trying to remain in the now. The simplest acts of walking, talking, eating and sleeping have created so many good things for me. My five new friends I never knew existed, have given me so much of themselves that I have been able to look myself in the eye and search for what I can give back. Walking through the columns of the forest, standing high in the wind looking all around at snow peaked mountains, swimming in the crisp, clear lake, surrendering to the cold. I was given time to feel comfortable with myself and then I felt at home in Nature. By having the space and time to de-clutter my mind, I was able to turn my attention to all the little things around me and to begin to see things as they really are and not in the same mundane way I was used to. Suddenly, I found great joy in looking at the smallest things; the body of a mosquito perched on my arm, a bundle of needles from some great tree . . . for that, I am grateful. These trips I’ve been going on these last couple years have been getting only better and better. I have so much love in my heart for this program, its mentors, staff and every participant I’ve met so far. I live life to love everyone and everything and this trip has been just an amazing opportunity to exercise and carry out that quality as well as receiving it. I come home excited to greet the world with the new me and I plan to do it proudly. I feel very blessed to have been able to see the things I’ve seen, feel the things I've felt and sleep in the places I've slept and prayed. And I pray and hope someone else will be as fortunate to embark on the wonderful journey I've just come home from. I look forward to many more trips with journeys and I most definitely recommend these trips to everyone. And send my love to everyone who will or will not be going on this trip. This trip was something that I will remember for many years to come, and hopefully I will never forget the lessons I learned. The people I have met on this trip are some of the nicest, deepest, and generally some of the coolest people I have met, and I hope to stay in touch with them. I cannot convey through words the incredible things I have experienced. Among them are the views I saw, the lessons I learned, the insights I had, and I will never be able to describe how amazing food tastes after a long hike. To the person reading this, whoever you are, I recommend that you go on a Rite of Passage Journey, as it will be worth it and you will learn things about yourself and realize things you may never have imagined. In a time that there was no time and yet there was. 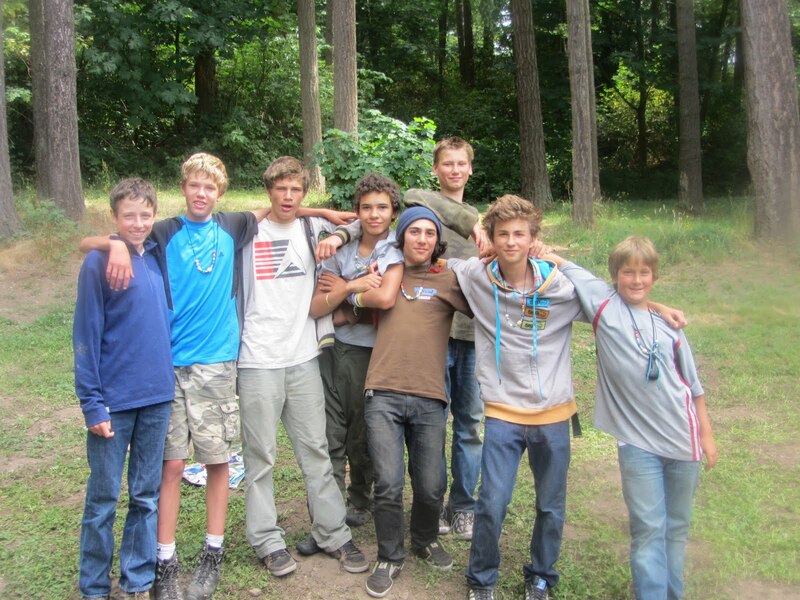 A group of nine boys set out on a journey into the wilderness. They came from many different places, some knew each other and some did not. 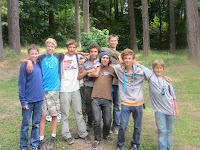 In the beginning they learned about teamwork, trust and respect and formed a friendship together. But, as the journey progressed, their number came to eight when one boy left to follow his own path. They met a master storyteller. A man of wisdom, he told them of the importance of listening. He told stories of great warriors, epic journeys, and insurmountable challenges. After listening to his stories they feasted on meat and bread. Then they set out to the wilderness. They trekked for many days and through many camps to a great peak. There they saw a powerful beast traveling in the valley below. In their descent, they enjoyed the snow and explored by the river. They returned to the road and they traveled to a massive ocean. They saw proud creatures of the sea and the forest. They sheltered there before trekking over sand and through the woods. They were tested in teamwork and trust when they were tasked with carrying an injured comrade's burden in addition to their own. Luckily they received help from fellow travelers who helped distribute the weight between the boys. They arrived at a time where they were not boys and not men. They fasted and meditated on what they were and who they wanted to be. They washed away their childhood and were welcomed into a new way of life. They were welcomed back as young men. They left mentors and started a camp of their own. At first they argued and quarreled. But they sorted out their differences and agreed to a pact. A pact of respect and shared responsibility. They then returned to the land from which they left to continue their adventures individually. Written by the Young Men of our Coming of Age for Boys II, 2011. Day One: Saying Goodbye and Hello. Much excitement had gathered while Jenna and I prepared to meet our group of 9 courageous 8- to 10-year-olds for a 7-day adventure in the North Cascades. By the day of the Send-Off, when we finally met our crew of campers, we were feeling blessed to be headed out on such an exciting Journey. 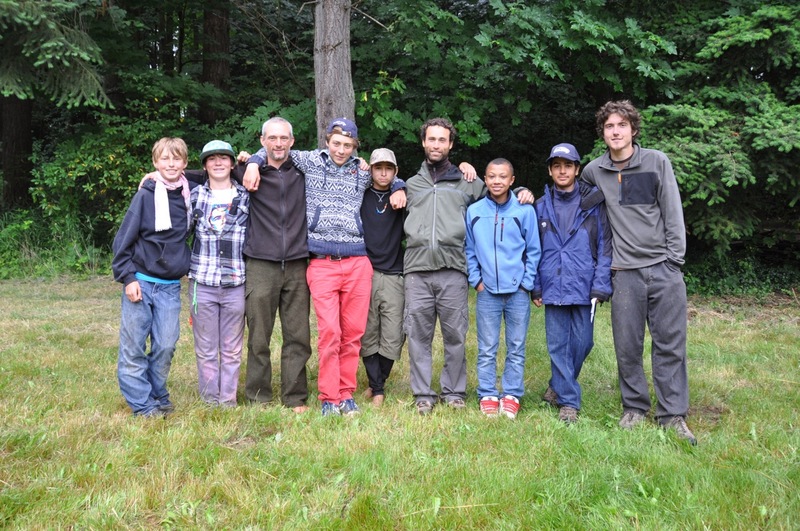 The Apprentice Journey is a special adventure because they are our youngest group of Journey’ers; and often we get to watch them “grow up” as they return for programs every couple of years. It is also special because it is packed with FUN! Instead of hiking a lot we get to just take the time to play and enjoy a wild place together. Parents and participants gathered on the first day at the Journeys Basecamp “meadow.” We unpacked and repacked bags and met the kids for the first time. After goodbyes were said we were immediately whisked away into the wilderness; our home for 7 days! Our first day in the wilderness proved to be a fun one! Our campsite overlooked Diablo Arm; a muddy-bottom and cold river that called the names of each of our campers. We explored the water for some time before cleaning off the mud and getting cozy for the night. Day Two: A rain bath to wash away the mud. Day two is never a great time to suffer the “big storm,” but sometimes you don’t have much of a choice. When nature decides that it is rain that you need, the rains begin to fall. What started out as a beautiful day, with a nice forest wander and some fun hiding games, quickly became grey and drippy. It wasn’t necessarily a “big storm” but it sure did rain for quite some hours; from mid-day until sometime in the night. At least our muddy laundry from day one was thoroughly cleaned! Day Three: Drying out and getting comfortable. After the rain ended, a day of sun was greatly appreciated. We spent the day wandering slowly to a beautiful lookout over Diablo Lake… looking at special plants and small critters along the way. We even stopped to dip our heads and faces into a small glacier-fed creek for a quick energizer; a small “Polar Bear Dip”. The highlight of the day was spent on a large sun- and moss-covered rock where we enjoyed sit spots and a yummy lunch. From Campsite 1: We figured that sleep would come easy on this evening after our first opportunity to backpack together… in the morning we had packed our backpacks and headed into the real wilderness; a first time backpack adventure of 2 miles for our young campers. Tucked into our sleeping bags, Jenna and I started an in-depth conversation about the next day. At one point we noticed headlamps/flashlights creating an interesting forest disco effect. We wondered what was going on… but didn’t investigate. From Campsites 3 and 4: Not so carefully tucked into their sleeping bags were our young campers who were participating in a nighttime, boys vs. girls, Douglas Fir Cone ambush. Turns out the flashlights were dangerous blinding tactics and the chant came from the girls team who were dressed in their sleeping bags, looking something like a nun. Day Five: The Hot Cocoa trick. You probably already know this about your children, and we were certainly aware of the possibility of this trick working… but now I would feel comfortable selling Hot Cocoa as a sleeping aid. The real trick is in the patience. It is true that each child will have a moment of sugared bliss, during which they will say things like: “Oh, man! My mom never lets me have this much Cocoa! She won’t give me one full scoop and you are giving me two. This is GREAT!” Or drink by lapping instead of sipping, as shown in the image. But here is the beautiful part… After this sugar bliss wears off you are left with a team of sleepy campers. The drop off happens quickly so you must remain ready to assist in the sleeping process: sing lullabies, read stories, etc. Since Jenna and I had mastered the art of a sugared snack before bedtime we decided to give it one more try; and since this was our night camping together it was sort of a special celebration anyways. This night it was Smores. We feasted and got ready for bed. Things were looking good and smooth… and all was mostly quiet. But instead of the Cocoa Effect, which was 30 minutes of crazy followed by bedtime, we got the Marshmallow Effect, which is about 30 minutes of quiet followed by the crazy sugar bliss (a delayed sneak attack, so to speak). Since we had a big day ahead of us Jenna and I ventured into the dark to give proper “Shhhs” to the campers. As we approached their tarp we found a large bump (a log maybe?) in the campsite where there had been none before (a rock??). Jenna leaned closer to investigate the bump and I stood back to investigate the larger scene. While pondering the situation quietly the bump suddenly sits up and says “Raaarh!” (Bear??!... Nope just a camper). We all shared a good laugh about Jenna’s and my reaction to the scare then said goodnight again. This time, silence followed and we all ventured into our dreams. Day Seven: The much-awaited reunion. Seven days is a long Journey for a group of 8- to 10-year-olds and we had certainly talked plenty about the people and pets and conveniences we missed at home. So by day Seven our campers were excited to be reunited with their families and pets. So if you have wondered, parents, siblings and pets, yes, the kids did miss you! We returned home to the sound of parents cheering and a drum beating. Had I not known differently I might have assumed this group of backpackers had just returned from summiting Mt. Everest. The reunion was sweet and the good-byes sweeter. On July 31st we sent off another group of young men (along with two amazing mentors) into the wilderness. Here are a few photos from the Send-Off Ceremony. May the trail rise up to meet you. and the rains fall soft upon your tarps. We are excited to see you all again very soon! Photos taken by Emily Pease. Arrival at Songaia basecamp was to begin what would reveal itself to be an imposition of joy, discomfort and challenge, as seven youth stepped into the unknown. Severing ties from their childish ways and choosing that which would be their counterpart is a long and difficult process culminating at the end of the trip during the reincorporation process. The representation it chose of itself was that of the wilderness and what marvel and beauty it cherishes. The sixty-mile hike from Cape Flattery was merely the importance held by the metaphor, as participants were those exposed to the subjection of initiating their first cautious yet courageous steps into manhood. Curious Seals, Sea Otters and Dahl Porpoises deemed their sighting a worthy one as they littered the Pacific Ocean that shapes the western coast. 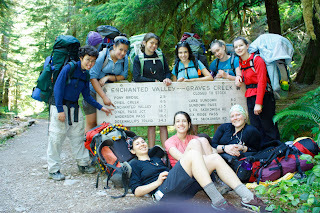 River and headland crossings were to taint challenging hikes. The experience denied no opportunity to swim in rivers and lakes throughout the three weeks; as well as their expressive parent: the ocean. Evenings revealed themselves to be donors of that valuable opportunity as posed by ‘council’; a sacred circle whose purpose is to allow genuine and authentic voices to express both emotions and fears as well as the provocation enticing listening from the heart. Mentors bless individual mentees as they cross the threshold to the ‘solo sites’, the chosen location in which they are to spend 24 solitary hours pondering both life and where on its surface and depth their feet will fall. Returning from the Journey each boy now a youth tells an individual tale of courage, confidence, and even terror. Crossing the final threshold on the comforting return home, each individual returns with a weight whose lightening of their load in life is evident. The gifts they bring are soon to be shared with the world. Written by Alessandro Genovese (Age 13), Coming of Age for Boys I 2011 Participant.